What size of bottom bracket (BB) do I need? To find out the size of bottom bracket needed, measure the inside of the bottom bracket shell in your frame, it most likely be 68mm, 70mm or 73mm. For threaded BBs then measure the total spindle length, this will vary from 103 to 135mm. Most road double is 103mm, Compact MTB cranks are usually 110mm or 113mm and Standard MTB cranksets are usually 122.5 or 127.5mm. What are the main types of bicycle bottom brackets? There are two main bottom bracket types. One is threaded into your frame and the other style is pressed in. 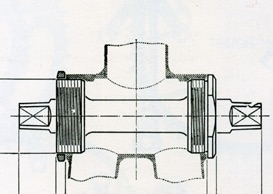 There are several versions of threaded bottom brackets. Cheaper and older designs use bearings that sit inside the frame with an axle that the crank arms are tightened onto. The most common and cheapest is a square taper bottom bracket. Shimano offer a multi splined (Octalink) interface and there is also a standard called ISIS, though these latter two are tending to be superseded by more modern designs. Most modern threaded BBs use a three-piece design that has a pair of large diameter bearings that sit on the outside of the bottom bracket shell, which an axle that is permanently fixed to one of the crank arms threads through. The advantage of this model is the the bearings can be made a much larger diameter, extending their durabilty and allowing the axle to be lighter, eg Shimano Hollowtech and SRAM GXP. Press-fit bottom brackets don’t require a threaded shell on the bike frame. They allow designers to make frames that don’t require tough and heavy inserts for the bearings to sit in. There are a number of standards here too. With BB30 the bearings press directly into the frame with only a small removable clip behind them to keep them in place. BB30s are more common on road bikes and are designed to be very light. A PF30 bottom bracket holds the bearings inside of a nylon or metal shell that is then pressed into the frame as a unit. It fairly common among mountain bikes but getting less so as BB92 is becoming more and more popular for various reasons (creaking noises and cost of manufacturing to name two). Shimano’s Press-Fit 92 uses the same spacing as their external, threaded Hollowtech II system and is cross-compatible with those cranks using the right 24mm spindle. Why are bearings important on press-fit bottom brackets? The bearings are highly important, as their quality dictates how much energy is lost as friction and how long they’ll last. If they are within your budget fully sealed cartridge bearings are preferable. They are non-adjustable, fit and forget units that don’t need any maintenance but have to be thrown away when they are worn out. More expensive units use bearings that have much higher tolerances, resulting in less friction and longer life. Mountain bike bottom brackets often have a larger amount of sealing for the increased demands of off-road use, which increases friction as a side effect. More lightly sealed, lower friction ‘Road’ versions are also common. Steel bottom brackets vs ceramic material bottom brackets - what is the difference? It is now possible to buy bottom brackets that have the bearings and races made from a super hard and strong ceramic material rather than the usual steel. The longer life is a big positive, but many manufacturers also claim reduced friction, which makes them attractive to serious time triallists and other riders for whom even slight gains in performance count.